This definitely makes my Proud Mommy Moments this week. As part of our family economy we all have jobs we are responsible for. For the kids their jobs are their responsibility, they have to do them; but if they do them without whining, complaining or having to be asked a lot of times then they get their point for it which translates into a weekly allowance. But I will tell you more about this tomorrow. Alex's job is to unload. She can't reach most of the shelves, so her unloading usually is her taking the things out of the dishwasher and stacking them on the counter and then I put it away. So not ideal, but at least she is doing it. But on this day, Lucas said, "I can help you Alex", ran and jumped up on the counter and she handed him all of the dishes to put away. So yep, proud mama this week. Oh my god that video is just the sweetest thing. He sounded like he was giving it his all! I'm so impressed that Alex and Lucas work together so well. We are just starting to implement chores in our house. It's hard, because I'm so used to doing everything in a certain way. Relinquishing control is hard! That is a proud mommy moment indeed! I like your term "Family Economy" and I might just have to borrow that to use in my house! Thanks for hosting and have a wonderful Thursday. Awesome proud moments there! I LOVE when my kids (very rarely) do their jobs without complaining! The video is precious! LOVE the little sound effects along the way! Haha! So cute, you should be proud! I love it when my daughter is happy to help me out! She loves carrying in groceries and just recently likes to put everything away for me too! How sweet! 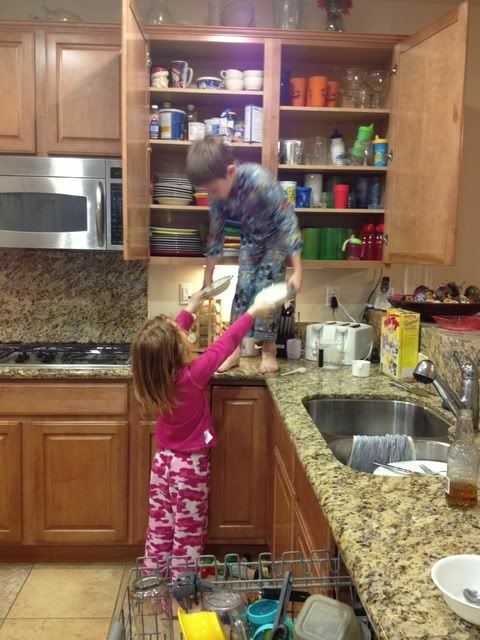 It must feel good to have your kids help out around the house. I need to get to know what that's like with my own kids! Thanks to you, we just started a similar system. No proud moments yet from it - ha ha - but we hope to all get used to it! Ryder's little grunts were the cutest thing ever! Made me giggle and smile. Loved it!! Still love the little grunty noises! I need to get my family ALL of them doing stuff. It's quite sad really. Aw, they are so cute. Such good helpers. Awww a proud mommy moment indeed! OMG girl-- you've got some cuties!! My daughter still thinks the dishwasher is a climbing object and pulls everyhting out, clean or dirty to throw on the floor... we will get there eventually!! Love your proud moments!! Fun post. My oh my Ryder is such a cute little man! You're raising your kids right! So does he get an extra point for helping?? I love to see kids helping!!! good for you! it pays off in so many ways!! That is so cute! I love it when my kids work together and help each other. Love it!!! And so very Montessori Emmy ;) the mantra being "teach me to do it myself"
awwww I love that they're helping! That's the cutest thing ever. That video is just too cute!